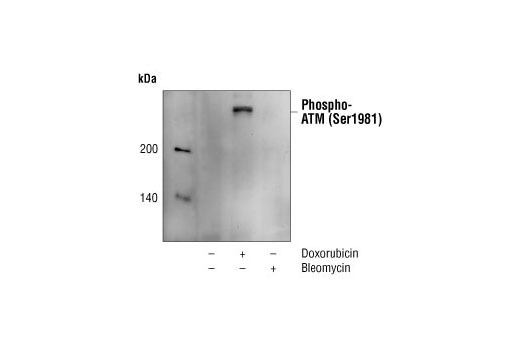 Western blot analysis of extracts from M059J cells, untreated, treated with doxorubicin, or treated with bleomycin, using Phospho-ATM (Ser1981) (10H11.E12) Mouse mAb. Phospho-ATM (Ser1981) (10H11.E12) Mouse mAb detects endogenous levels of ATM only when phosphorylated at Ser1981. Monoclonal antibody is produced by immunizing animals with a synthetic phosphopeptide corresponding to residues around Ser1981 of human ATM. This product is sold under license, U.S. Patent Publication numbers 2003/0077661 and 2003/0157572, from St. Jude Childrens Research Hospital.